(Nanowerk News) A gap-toothed peptide created by bioengineers at Rice University may be an efficient way to deliver insoluble drugs to precise locations in the body. Rice bioengineer Jeffrey Hartgerink and his students made a hydrogel of what they call "missing tooth" peptide nanofibers. Gaps in the fibers are designed to hold drug molecules that have hydrophobic -- water-avoiding -- properties. The biodegradable gel can be injected where needed and releases the medication over time. 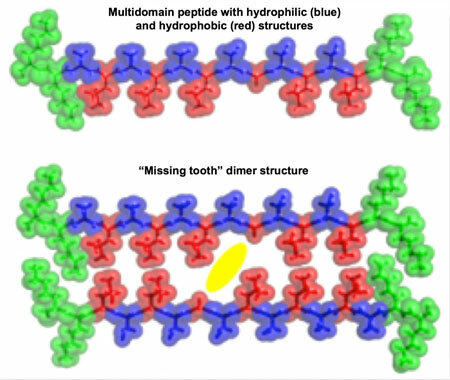 The material is the subject of a new paper in the American Chemical Society journal Biomacromolecules ("“Missing Tooth” Multidomain Peptide Nanofibers for Delivery of Small Molecule Drugs"). Hydrogels built of custom peptides are a specialty of Hartgerink's lab, which has introduced variations in recent years for tissue growth and healing through the clotting powers of synthetic snake venom. The new work by Hartgerink and Rice graduate students I-Che Li and Amanda Moore aims to administer drugs that tend to clump, which makes them difficult to deliver via the bloodstream. "Hydrophilic (water-attracting) molecules frequently don't need a delivery mechanism because you can inject them," Hartgerink said. "They're water-soluble, they go into the blood and they're fine. But hydrophobic drugs are challenging to deliver. We load them into the interstices of these fibers, and they can be delivered wherever we inject the hydrogel." In the lab's earlier hydrogels, proteins or small molecules are trapped in the gel created by the microscopic fibers. "Here, we've done something different: We modify the inside of the fibers," he said. "We remove part of the internal portion of the fiber -- that's the missing tooth -- and that's a hydrophobic environment." To make the unique fibers, the lab first made custom peptides with alternating hydrophobic and hydrophilic amino acids and left intentional gaps. 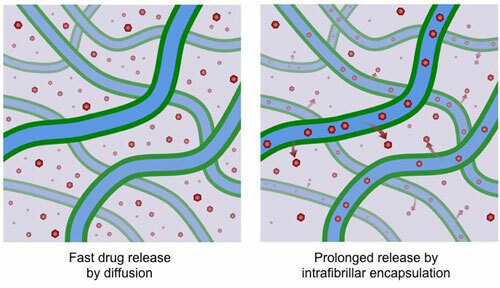 Hydrophobic small-molecule drugs mixed with the peptides were attracted to the gaps and trapped when the peptides self-assembled into jaw-like fibers. The hydrogel becomes a liquid due to the shearing forces encountered as it passes through a needle, a phenomenon called thixotropy, and it returns to gel form in the body. 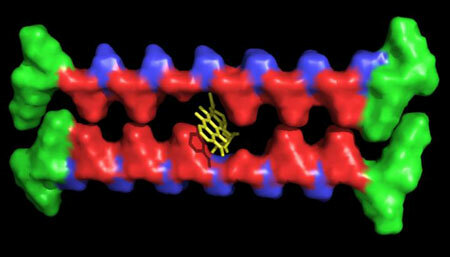 The drugs nest in their peptide pockets until released by the hydrogel. The lab has tested hydrogels with cancer, antibiotic and anti-inflammatory drugs and is studying how the drugs are released over time. Hartgerink said the "missing tooth" hydrogel can serve more than one function. "We can simultaneously trap hydrophilic proteins in the hydrogel matrix," he said. "There's no reason we can't do both at the same time. This paper just looks at one aspect, but they're not mutually exclusive approaches. The long-term goal of this material is that it eventually can do everything."